New Unchrated 3 gameplay shows how to catch a plane you missed. Uncharted 3 is without a doubt one of the most highly anticipated this years for the PlayStation 3, while the PS3 itself has been having its share of exclusives this year with the releases of Killzone 3, Infamous 2 and Resistance 3 but out of all of these Uncharted 3 is but the icing on the cake on every PS3 gamers mind right now. The gameplay was shown at this year’s GamesCom hosted in Cologne and it shows just how amazing Drake still is despite age catching up with him. Nathan Drake is the favored protagonist of the Uncharted series; Infamous and Uncharted were the new exclusives which came with the release of the PlayStation 3 and were never seen before on the PlayStation 2 like Killzone and God of War 1 and 2 were but in only a matter of time was Uncharted able to show its appeal to the gamers of the console with the release of Uncharted: Drakes Fortune and later on Uncharted: Among Thieves with the latter being the turning point of the series really picking up speed. 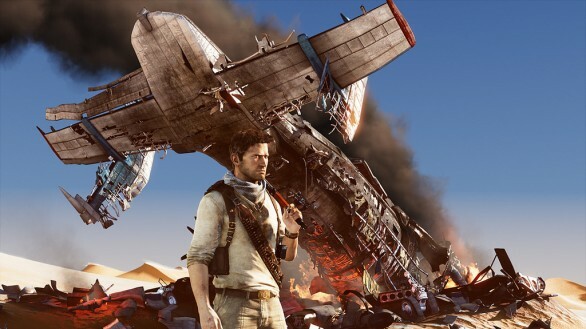 With the release of Uncharted 3 you can expect thrills upon thrills like a Michael Bay movie with never a dull moment in the game, the gameplay shows Drake attempting to enter a plane but when he misses his flight he stows away in the landing gear of the plane and later on has to fight a very powerful opponent over life and death, with a very cliffhanger ending of Drake hanging on by the Yellow belt of the cargo one can only hope that this is the beginning of the game and that we get a demo of the game before it’s released. The Beta of the game has already come and gone and with a November release date its only a matter of time before Naughty Dog releases a Single player demo for the game to help get fans excited for the game.